nick sasso florida building code expert - BUILDING a new home? Homeowners have reported strange odors and pitting and discoloration of metal plumbing, electrical fixtures, and air conditioning equipment since 2007. Many homes built or repaired in 2006 and 2007 due to the hurricane damage which occurred in 2004 and 2005, caused a shortage in gypsum drywall. Because of this spike in construction, drywall was imported from China manufactured by Knauf. Unfortunately at the time, contractors were unaware that the material was substandard and had an increased amount of organic material which produced hydrogen sulfide gas when it became moist. Much of the drywall sat inside cargo holds of large ships for several months until it was approved and allowed to be offloaded. Most of the incidents occurred in the Southeastern part of the U.S. but there have been reported incidents in as many as 30 states. Most homes must have been built after 2004 to qualify for any financial assistance from the government. Check with your local department of health to determine how to report an incident, or you can go to the Consumer Product Safety Commission website for drywall incidents. Although some companies have developed test to determine the presence of hydrogen sulfide, these are not considered conclusive as there may be lower levels of the gas present in domestic drywall as well. The odor of rotten eggs or a slightly sweet smell may be present, especially when you enter the home from outside. It will subside after a while when you become accustomed to the smell. When the drywall becomes moist, as on a rainy or humid day or extended period of time, the drywall will generate hydrogen sulfide gas which will corrode metal objects inside the home, even electrical wiring. 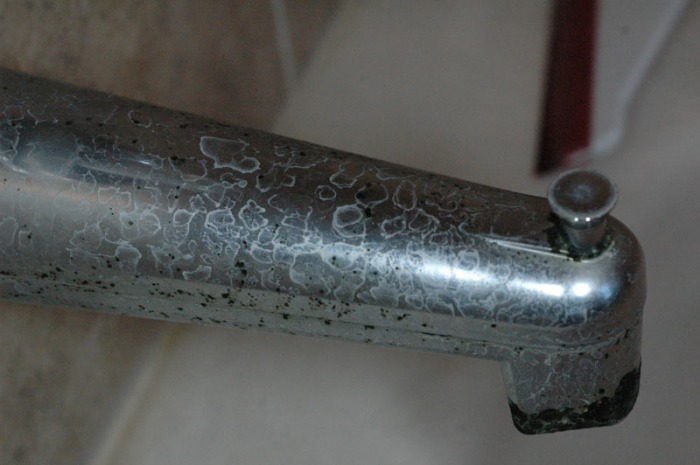 This corrosion is apparent on chrome plated plumbing fixtures such as shower heads, faucets, and towel bars. Copper tubing inside air handling equipment will become corroded, ground wires and screw terminals on electrical outlets or any electrical terminal that comes in contact with the air inside the home. Copper piping and tubing will also turn dark brown or black. The corners of mirrors will turn black as the acid caused by the gas dissolves the metallic coating on the back of the glass of the mirror. However, the presence and extent of corrosion within a house, or even within a room, however, appeared inconsistent. This can be due to varying levels of contamination within the drywall material, and that the home may contain a mix of tainted and untainted drywall. Not only have homeowners reported the discoloration of fixtures, they have also reported failures of certain components such as: failures of central air conditioning evaporator coils located indoors as part of the central air conditioning unit air handler; and intermittent operation or failure of appliances, such as refrigerators and dishwashers, and electronic devices such as televisions and video game systems. The Consumer Product Safety Commission has not received any reports of fire, electric shock or potentially hazardous incidents , such as discolored, overheated/burned out, or smoking components, related to the drywall. The CPSC is focusing on a few key areas which include electrical components, gas service components, and fire safety components. Electrical components include residential wiring, receptacles, switches, circuit breakers, panel boards, ground fault circuit interrupters (GFCIs), and arc fault circuit interrupters (AFCIs). 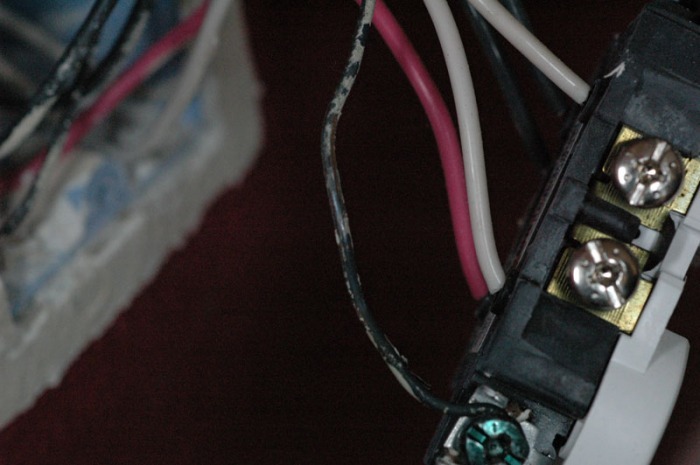 Deterioration of connections such as where a wire is connected to a receptacle or where a circuit breaker is installed in a panel board. 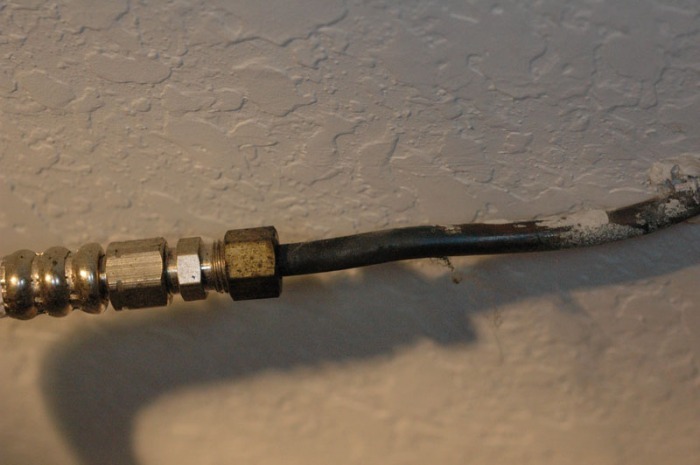 A degraded connection could develop hot spots resulting in overheating and possibly fire. Erosion of copper conductors over time, reducing conductor cross-sectional area and compromising its physical integrity. If the corrosion is progressively eating away at a wire, the wire would eventually lose its capacity to carry current and start to overheat or become physically weak and break. Damage to circuit traces or electronic components on printed circuit boards causing failure of protective devices like GFCIs, arc-fault circuit interrupters, and smoke alarms, which can present shock and fire hazards from the loss of protection provided by these devices. Gas service components including flexible connectors and copper piping. The concern is that potential gas leakage due to corrosive pitting of piping could present a fire or explosion hazard. Fire safety components including smoke alarms and fire sprinklers. For smoke alarms, potential concerns include damage to electronic circuitry and degradation of the sensor. Either condition could result in an inoperable smoke alarm. For fire sprinklers that use metallic fusible elements, potential concerns are that corrosion may adversely affect activation temperatures. Failures of these devices can put consumers at risk. Low levels of carbonyl sulfide and carbon disulfide gases were detected in some samples obtained through testing conducted by drywall manufacturer’s consultants. These sulfur-based compounds occur naturally in the environment, such as in swamps. Some industries produce these gases such as paper mills, textiles, and petroleum refineries. Cigarette smoke, septic tanks, wastewater treatment, and automobiles also emit these compounds. Sulfur gases are colorless and have an unpleasant odor, often described as smelling like a rotten egg. Homeowners also report smells similar to fireworks or striking a match. Most people can smell these chemicals at levels below those known to cause adverse health effects. There have been no studies conducted on the long term effect of exposure to carbonyl sulfide gas, but the chemicals affect the eyes, nose and throat. Copyright © 2015 florida-building-code-expert.com. All Rights Reserved. DISCLAIMER: All links, applications and other information on this site provided AS IS. No warranties are expressed or implied.